Anyway, while I won’t presume to have done better, I did want to throw my hat in the ring. 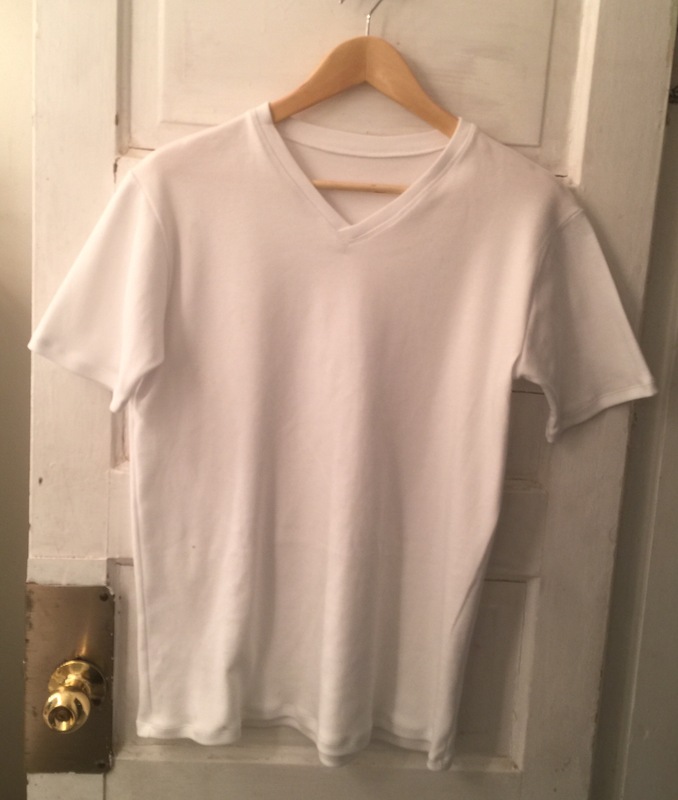 I had attempted a tee for him before from the Thread Theory Strathcona, but it didn’t fare well—the fabric was wrong, the fit not right, and my attempts to hack a V neck version were either too high or too low. I even ordered some expensive cotton interlock from them to try again with a more “typical” fabric, but was too chicken to cut into $18/m fabric without a more successful trial. Last Christmas, a friend had great success making tees for her various male family members with Jalie 2918, so I thought I’d give that one a shot. And then, like mana from heaven, my Fabricland got in a shipment that, for the first time since I’ve worked there, included actual white interlock. For $14/m, but half-price sales are a dime a dozen at Fabricland. And then I was able to snaffle up a grubby remnant—just barely enough to squeeze out a trial version. Perfect. Anyway, I mainly just want to note down the fitting changes I made, for next time. If there is a next time. I cut the size Y, for a 40″ chest. The shoulders are good but the rest was a bit loose. Before anything else, I took a 1/2″ tuck through the shoulders (what I call a petite alteration when I do it for myself.) My husband, like me, has a lot of leg and a short torso for a man of his height. 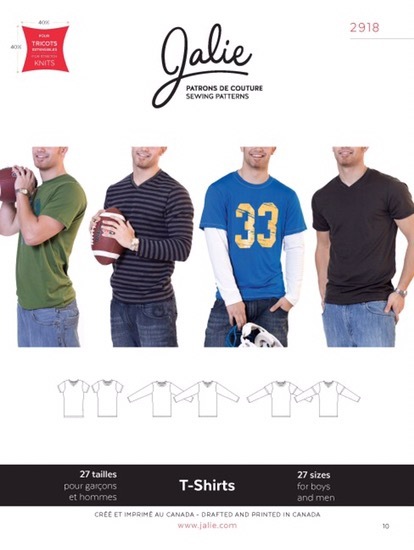 I have also noticed, in altering some storebought tees for him this past year, that he likes a much higher armscye and tighter sleeve than is typical (actually, pretty much like the black shirt on the right of the pattern photo looks). 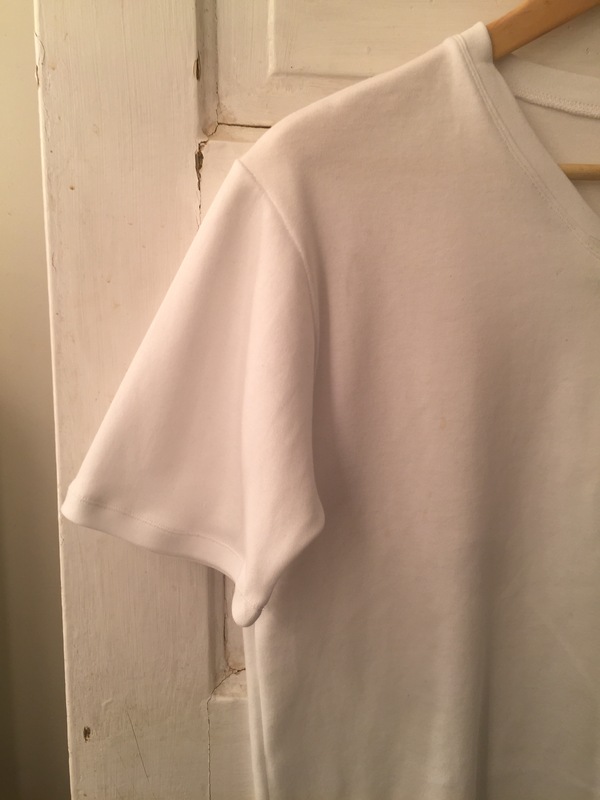 So I raised the underarm a good inch as well, and took a vertical tuck to remove 1″ from the sleeve width. 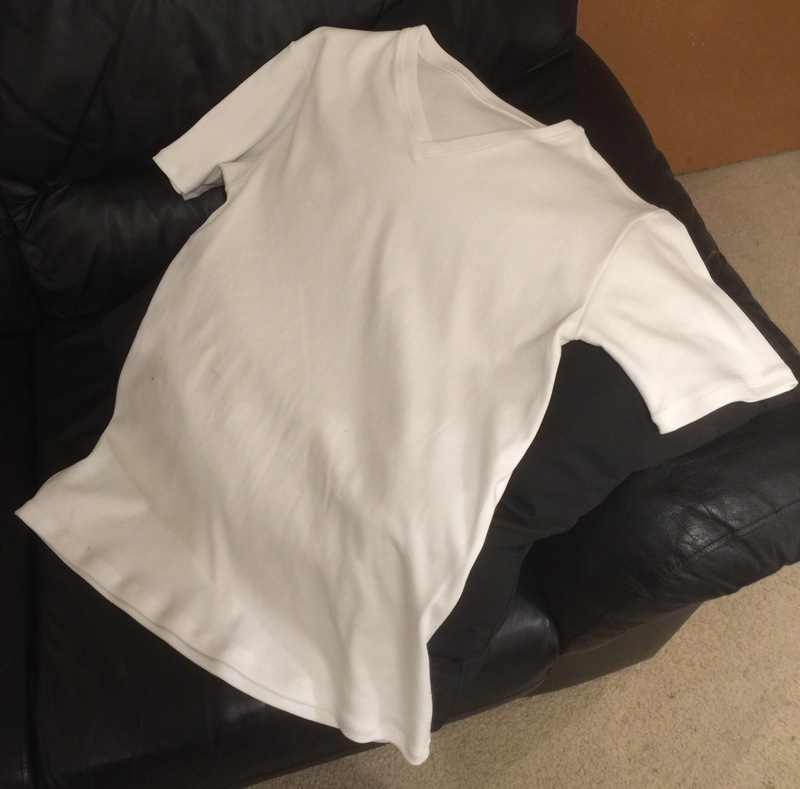 I took in the sleeves a full 3 cm off the underarm seam (so 6 cm per sleeve, in addition to my first tuck) before the fit in the sleeve was “right”; I only took 1.5 cm off the side seam, so 3 cm per seam, 6 cm around the body of the tee. So I could perhaps go down to a 38″ chest pattern. And that’s the story for the moment. The tee is finished and in the drawer, and at least he seems to like the fabric this time. I’m going to see how he likes wearing it (and if he wears it 😉 ) before I try another one, though. Looks really good! I need to buy this pattern for my guy. Love the V neck! If it looks as good on him as it does on the hanger, you’ll be churning out dozens of these soon! Nice to know it’s a good pattern. I don’t like the stuff my husband buys in the stores. This would be so much better! 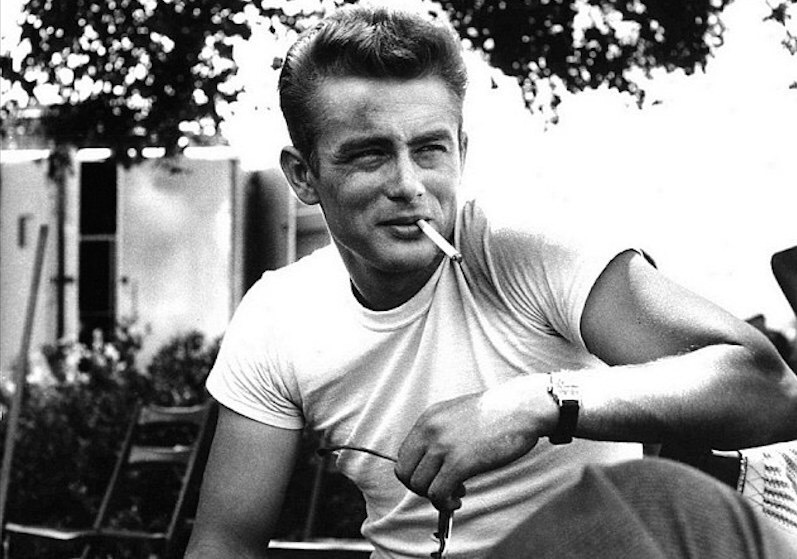 I’ve made the Strathcona once, and it was the most perfect loose fitting boyfriend-style tshirt…For me. I’ve since made it numerous times, but none of which are for him. I hate all of his t-shirts and at some point I’ll have to make him a few. I’m planning on cutting one of his current ones for the pattern. 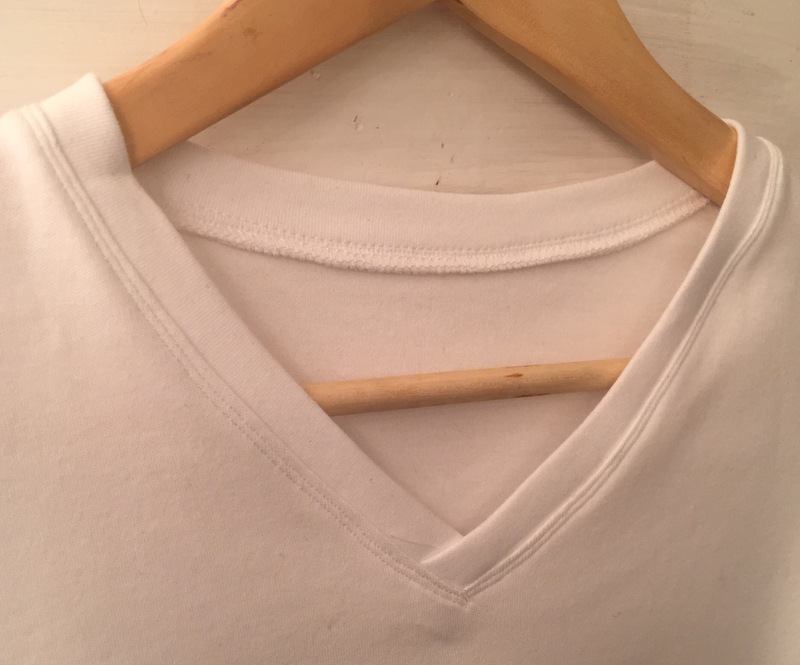 I have no patient to do alternations on a t-shirt… (Just so I don’t sound like a really bad wife – his t-shirts are objectively awful, have holes, and some are stinky beyond laundry. But he couldn’t care less).